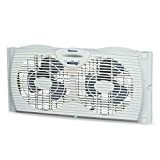 The Holmes Window Fan with Twin 6-Inch Reversible Airflow Blades provides relief from hot weather by drawing in cool air from the outdoors or exhausting the stale indoor air when installed facing outward. It’s designed to fit virtually all slider and double hung windows. The quiet and efficient operation makes this idea for living room or bedroom use. The fan’s extender panels allow for a safe, custom fit. The manually reversible feature lets you control your airflow for intake or exhaust.